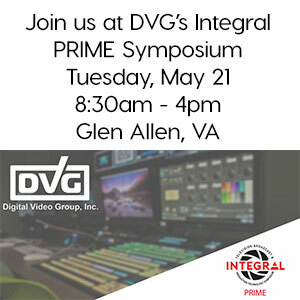 DVG will be hosting The Integral PRIMESymposium Tuesday May 21, 2019! This event will include five separate workshops as well as product demonstrations from over 30 of the industry leading manufacturers. See the latest in broadcast and production solutions. Seminars with guest speakers from the industry will be covering a number of topics ranging from 4K to video over IP. Lunch will be provided at no charge if you register by May 17th!! !